The great thing about replied app is that you have multiple invitation options to choose from. All the options below give you the ability to quickly and conveniently receive all your RSVP replies with the replied app text rsvp app. After you setup your replied app account and receive your dedicated RSVP phone number, use one of the options below to setup your invitations. A lot of weddings still go the traditional route with paper invitations and RSVP cards, and pairing this with text message RSVPs is a great option because it takes the headache out of receiving RSVP replies in the mail and counting them up by hand. Also, buying the extra stamps for your guests to mail their RSVP replies back gets very expensive. To save even more money and skip buying RSVP cards, you can include your dedicated replied app RSVP phone number right on the actual invitation. The other option is to include a traditional RSVP card, but instead of including a return envelope with a stamp, place your replied app number on the RSVP card. With this option, your invitations are free and you can send as many as you want by including the guests email addresses. 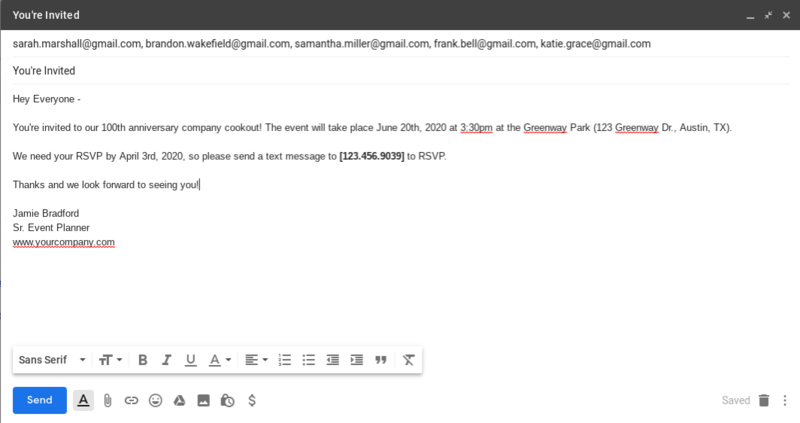 We used a corporate event (company cookout) as an example. Once the email is received, the guests will text your dedicated replied app RSVP phone number and the replied app platform gathers and tallies their RSVP replies automatically. Be sure to place your replied app phone number in the bolded area.